Geniet iedere dinsdagavond van Viva La Pasta bij De Heeren met live entertainment van Wendy-Jane Gomes! De heerlijkste pasta's, boordevol verse ingrediënten en de meest verrukkelijke sauzen. Geniet iedere dinsdagavond van Viva La Pasta bij De Heeren met live entertainment van Wendy-Jane Gomes! De heerlijkste pasta’s, boordevol verse ingrediënten en de meest verrukkelijke sauzen. Reserveren doe je gemakkelijk via een PM! Its Taco Tuesdays every Tuesday at SPLASH Poolbar!! Join us fron 6 to 9pm for all you can eat tacos. Choose your favorite from chicken, beef, fish and vegetarian to satisfy yyour taste buds. For more information, please call +599 9 840 4220. Starting upcoming tuesday from 6:00 pm till 10:30 pm. High quality pasta served at very low cost! Make your reservation as soon as possible! 6:00 pm till 10:30 pm. High quality pasta served at very low cost! Share ❤️this succulent Premium Steak Platter, available only on Tuesday night. Picanha ,Skirt Steak ,Tenderloin ,Ribe Eye, all in one plate. ? ✔8 pcs of Premium Steak Cuts. ✔for only Ang 125 .- ? Plate of nachos with choice of 3 toppings, BBQ chicken, grilled steak and spicy shrimp. Contact us for detailed information about the band monthly schedule. Benjamin Emanuel on the Sax every Tuesday at Mood Beach. Enjoy a delicious dinner while listening to this talented young man playing such a classic instrument as the Saxophone. Join us every Wednesday, to enjoy our SUPER SPECIAL of: - T-bone (450g). +Shrimps. +Side order. ALL YOU CAN EAT SUSHI every Wednesday ツ ?? 2nd shift: 8 pm -10 pm Fl. 60 p.p. For Reservations call 747.0007 or send us a message. Join us for an Italian inspired sangria every Wednesday night at Pizza Mare. Every Wednesday we at Scampi’s will be serving your our #BudgetWednesdayMenu where you’ll be able to eat like a King/Queen and still save money at the end of the day for only Fl.50,- per person! Come and enjoy where the food is as good as the view! Choose any pasta dish on the menu for only 27.50 florin. You may choose your type of pasta as well: Penne, Fettuccini or Spaghetti. Wine & Dine is always a good idea! 2 glasses of white wine or red wine and warm flatbread with dips. One pound of Garlic shrimp accompanied with a glass of Sauvignon Blanc for only Fls 34,95 on Wednesday Nights. Live entertainment by "Cuban Express". Live entertainment by “Cuban Express”. Thursday has a new meaning in Curacao, it’s called Ribsday! The Grill King invites you to join us this and each Thursday for our Ribs Night. Pay 1 and get the second slab at half price or bring 4 persons and 3 PAY! Delicious, juicy grilled ribs. You can’t miss this! For reservations call us at 4616870 or just drop in at The Grill King, Your Family Steakhouse! Kick off your weekend with a 2 in1 tour followed up with a succulent dinner at restaurant Zambezi! Contact us at 74727777 or 5105203 for more info or reservation! Kick off your weekend with a 2 in1 tour followed up with a succulent dinner at restaurant Zambezi! Contact us at 74727777 or 5105203 for more info or reservation! Zest Beach Café nodigt u uit om te proeven van heerlijke ‘Rock Lobster’ of vers gevangen Caribische vis! Elke vrijdag vanaf 18:00 uur! Experience the bounty of the sea at Baoase Culinary Beach Restaurant. Besides our a la carte dinner menu, we present a truly amazing Fruit de Mer live station. Juicy mussels, clams, the sweetest crab, lobster and magnificent oysters, all served and to be shared for those who love seafood. Every Thursday between 6PM – 10PM, dinner with a special focus on the freshest, tastiest shellfish and seafood from local and international markets. Be surprised by our Chef’s mixed platter or you can create your own platter of cooled shell fish. You can even indulge yourself in our royal Ossetra caviar served with classic garnish and blini’s. Canadian Lobsters start at $37,50 (half) and it is also possible to order items of this special menu just as an appetizer or snack platter. With Papaya Salad, Sambal Goreng Tempeh, Mock chicken Ding, Glass Noodle with tofu and Green Curry. The 3rd edition of Borrel Fabriek will have a Mexican flavour! If you’re someone who’s creative at work or in your private life, then Borrel Fabriek is the place for you! The 3rd edition of Borrel Fabriek will have a Mexican flavour! If you’re someone who’s creative at work or in your private life, then Borrel Fabriek is the place for you! Every last Wednesday of the month we’ll break the week in half from 6 pm onwards. Relax from work in a fun environment, exchange knowledge and ideas, meet new people, have pleasant conversations and grab a bite. Each edition we’ll have new creative guests who will present us their most special inventions. For this edition, we’ll have Charity Snijders-Sprockel with her homemade jewelry of Charzain Jewellery. And Jolien Mark, who paints with acryl on canvas and aquarelle on paper. Check out her fb page Joliens Art Curaçao to get inspired by her work. Next to those creative women, we will have a surprise for you! Do not be afraid, but be part of it! We’ll also have Ado Gysbertha aka DJ ADO with some Mexican flavor music. So, tell your friends and be part of this creative gathering! Every Thursday from 6:30 PM to 9:30 PM enjoy the best Indonesian food for ANG.45 P.P. includes an Absolut welcome cocktail. Kreeft Thermidor. Heerlijk! Maar... wat is het precies? "Kreeftenschaal gevuld met gekookte kreeft in een romige witte wijnsaus, overdekt met een laagje Parmezaanse kaas en goudbruin gegrild". Elke donderdagavond @ Mei Mei! Kreeft Thermidor. Heerlijk! Maar… wat is het precies? “Kreeftenschaal gevuld met gekookte kreeft in een romige witte wijnsaus, overdekt met een laagje Parmezaanse kaas en goudbruin gegrild”. Elke donderdagavond @ Mei Mei! We know how to BBQ! Have 1lb of Shrimps cooked your way for only Fl. 35.00, receive a complementary glass of Pink Moscato and a surprise by Beringer. For reservations please call 4650769 or 6932518. Every Thursday, it’s BBQ Night at Scuba Lodge. Starting at 7:30 PM, you can sit back and listen to the waves crashing while our chef fires up the grill. For just $25/ANG 45, you will enjoy a 4-course dinner (incl. meat, chicken, and fish). Included is a buffet with a variety of salads and dressings, french fries, baguette, and other side dishes. Don’t forget to make a reservation! Contact [email protected] or contact +5999 465-2575. For reservations call: 738 0038 // Grand Cafe Mahaai. Live presentation from folklore group "Memoria di Korsou". Live presentation from folklore group “Memoria di Korsou”. **Not for take out. Dine in only. On Friday we are going to explore the wild culinary and musical aspects of the Caribbean. Every Friday from 6 to 9 PM you can enjoy delicious dishes and cocktails from 8 different countries in the Caribbean. Or get on the dancing floor and try one of the many local dances of the Caribbean, during a workshop and demonstration by the one and only Salseros con Clase Dance Company.
? ?FRIDAY’S DINE & DANCE ? ✔Happy Hour in The Bar all night Long ? ? languages ​,with the talented Maria Fernanda. Exotic 3-step menu for only 65 fl (prosecco Glass included.) Don’t Miss it! The T–bone steak is a cut of beef from the short loin.. In Curacao, on this beautiful island, the best T-bone is in our restaurants! Visit us and enjoy the best cuts and the best promotions for you! Every friday night Shelterrock has a coconut night! That means that we prepair food inside of a coconut! You can choos between , shrimps , seafoodmix , Vegetariaan , Chicken , Beef! it is all prepared under hot coal. And to make the evening even more fun, we also have karaoke night at Shelterrock Paradise. Order your favorite burger from our extensive burger menu. Special 1 KG burger, for 29 US$, finish it within 30 minutes and it is free. ・Ultimate beach day・ Spend your weekend at Mood Beach, with a luxury breakfast and a luxury beach bed for just Nafl 39,50! Spend your weekend at Mood Beach, with a luxury breakfast and a luxury beach bed for just Nafl 39,50! Every Saturday you can enjoy Sushi Saturday at Koraal. 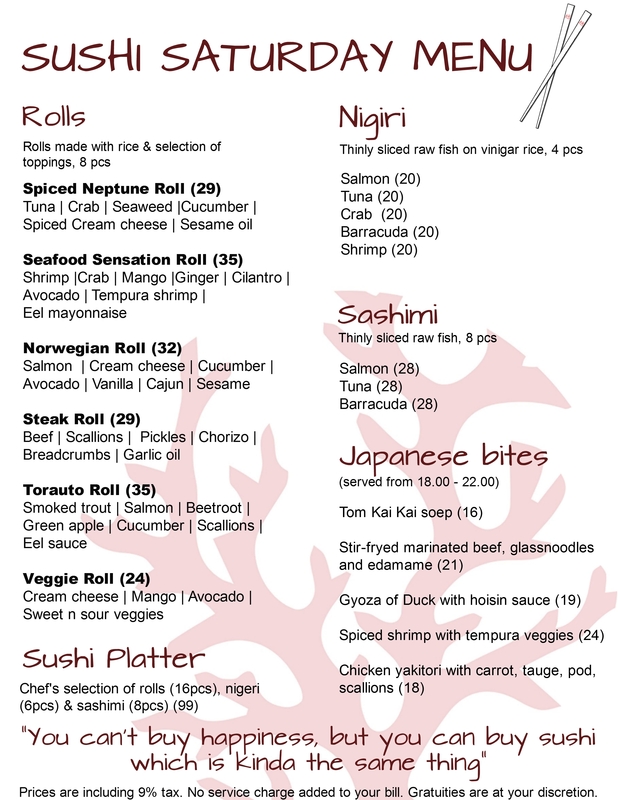 Enjoy delicious sushi rolls, sashimi and nigiri for lunch, bites or dinner. Of course combined with special Japanese style cocktails. In the evening you can also enjoy some additional Japanese Bites for dinner. Check out the menu here! don’t hold back. Beer special. Jazz night is always a good idea ? Join us this Saturday [April 7] and vibe between the melodies while having a relaxing dinner. During this 2 to 2,5 hours we will serve you The Culinary Version of Barbecue located at Baoase beach. Combining the inspirational Texas barbecue meats, Mexican influences on the side and European cooking techniques. Madero’s Sunday Brunch will be filled with some great music by our resident DJ and various live performances. It will be a delicious celebration with trendy vibes and a great atmosphere. By your special request, we present …..the best pastas and risotto’s in the land!! Every Sunday from 17:00 -21:00. Reservations are advised. See you on Sunday, by the pool!! Only at Roast Gastrobar!! Sunday’s are meant for barbecue… Italian Style Barbecue! Join us every Sunday for the one and only Italian Style BBQ on the island. Steaks, ribs, lobster, pasta salads and so much more. For reservations please call +5999 4659669. See you this Sunday! On Sundays, we welcome guest chefs Ronald & Denise who serve authentic Indonesian satay in the lounge of our restaurant. The satay is full of flavor and is served on a banana leaf with rice, onion, cucumber, and peanut sauce. It’s only Nafl. 25,- per portion and you can either eat in or take out. Just note that there’s a limited number of satay available so come early to avoid disappointment! At our pop-up bar, you can order refreshing cocktails including our signature watermelon mojitos. For group reservations, please contact us at [email protected] or call (+5999) 465-2575. The Miek Miek Saxo sounds & the Sunday Sunset ? Accompanied by the best meals of the Island! Zin in lekker chinees eten? Dan zit je op Zondag bij de buren op de perfecte plek! Wij hebben iedere zondag een chinees menu. Chicken or Shrimp roti, with a bottle of beer. The Cabana Steak market offers a prime selection of the most beautiful steaks and other varieties of delicious meat. Our chef will advise you about the options presented on an impressive open-air buffet, tell us how you prefer your meat and we will grill it for you! A delicious, freshly grilled meal is guaranteed! The formula is honest and simple. The steaks are prized per 100 grams. You tell our chef the types and quantity of meat you prefer. Your choices will be professionally portioned and weighted. When your plate of tailor made steaks is complete, we will grill it for you. When ready, your freshly grilled meal will be served with a complimentary garniture. Other than delicious food, live entertainment makes the steak complete. From 20:00u, Gino Coelho and his piano, with changing vocalists will bring you the ultimate Caribbean experience. Every First Friday Of The Month ! Unlimited feast of a dozen authentic Indonesian dishes, prepared in buffet form.